Last week I met up with one of my best friends and we decided to go to Birmingham for a late lunch/early dinner and a catch up! While in Birmingham, we went around the city centre trying to find somewhere to eat. 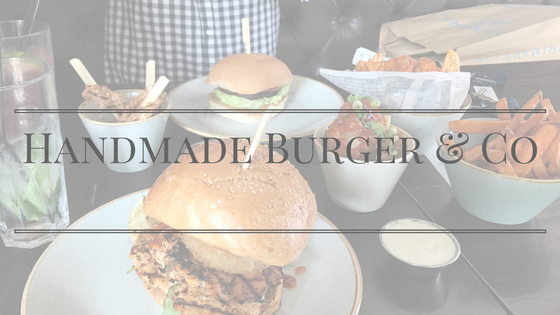 We wanted it to be something casual and therefore decided to go to Handmade Burger & Co! When we went in we were sat down pretty much instantly and were given the menu's. We of course started talking and in a couple of seconds the waiter came back to see if we had decided on what to order for drinks...at this point we felt a little rushed and it seemed bizarre as we practically had just sat down! I ordered an elderflower fizz and my friend ordered the raspberry fizz, these both were available as refills, where as the other soft drinks weren't. Next, I went to order the peri peri chicken burger, sweet potato fries and hot chicken wings. My friend ordered a small veggie and bean burger, cajun chunky fries and marinated chicken bites. Our food didn't take long at all to be made and was served efficiently. I must say the burgers are pretty amazing and full of flavour! Mine wasn't really spicy so I added their red table chilli sauce which bumped up the spice and added a lot more flavour! I loved the sweet potato fries, they were crispy and soft inside, I am defo going back just for them alone. The wings, unfortunately I was not too keen on, however my friend recommended me to try bbq version next time! The burger had filled me up and when it came to eating the wings I was too full so maybe that's one of the reasons why I didn't enjoy them as much. I would like to go back and give the wings another try. My friend also loved her meal so we both couldn't really complain. The waiter did offer us refills throughout the meal and kept our drinks topped up. We used our student discount (25% off) and it ended up being around £14 each which we thought was a bargain for so much food and refillable drinks! Would I go again? Yes I would! Have you been? Let me know how you found it and what you ordered!